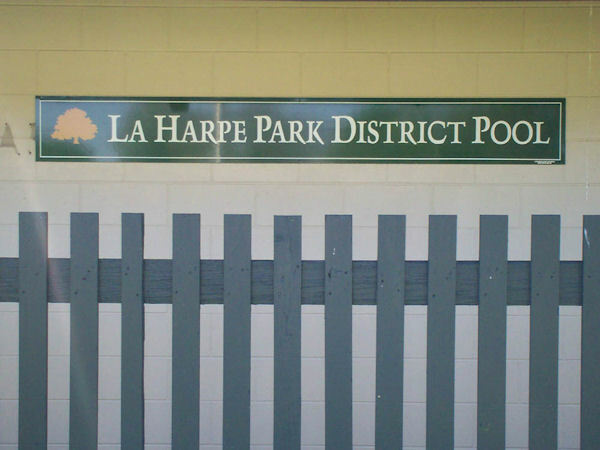 The La Harpe Park District's Community Pool is soon to open up for it's 28th year of business. Jodelle Eddington is back in the saddle for her second year of managing the pool and all of its activities, and she's gearing up for another summer of fun in the sun. The pool staff, which includes Megan Harkey, Blake Mealey, Tess Eddington, Erica Eddington, Tyler Sharpe, Shane Painter, Bryan Rodeffer, Jesse Holtsclaw, Kelsey Wisslead, Claire McKee, Breckon Bice, and Assistant Manager Marissa Brown, has already started the clean-up and remodeling phase. Unofficially, the park district started off this step, as they put up a new sign to replace the lettering attached to the outside wall that was beginning to struggle. During this time period, those that work at the pool are getting everything out of the pool, such as leaves, sticks, and anything else that may have found it's way in the pool since last summer, as well as repainting the concession area, locker rooms, and any other areas that need a touch up. The pool is also going through thorough inspection to make sure everything is running correctly and will continue to stay in perfect working condition throughout this summer. In terms of an exact start date for this upcoming pool season, Jodelle said, "We're shooting for June 1st." Prices will remain the same as they were last year with an individual daily session running $2 per person, $35 for a single membership, and $65 for a family pass. Their hours of daily operation will also remain the same as last year, and will be open 1-6 p.m., seven days a week throughout the summer months. The pool may also be reserved for private outings. The same great concession items will be available to quench patron's thirsts or fill them up, offering nachos, pizza, ice cream, hot dogs, and assorted varieties of candy, Sno Cones, as well as different kinds of pop. Make sure to "beat the heat" this summer at the La Harpe Park District Community Pool. "Here's the new sign that replaces the old lettering on the front of the pool house."